An ambulance is a self-propelled vehicle specifically designed to transport critically sick or injured people to a medical facility. Most ambulances are motor vehicles, although helicopters, airplanes, and boats are also used. The interior of an ambulance has room for one or more patients plus several emergency medical personnel. It also contains a variety of supplies and equipment that are used to stabilize the patient's condition while en route. The earliest ambulances were simple two-wheeled carts used to carry sick or wounded soldiers who were unable to walk by themselves. The word ambulance comes from the Latin word ambulare, meaning to walk or move about. The first ambulances specifically used to transport patients to a medical facility were developed in the late 1700s in France by Dominique-Jean Larrey, surgeon-in-chief in Napoleon's army. Larrey noted that it took almost a full day for wounded soldiers to be carried to field hospitals, and that most of them died in that time "from want of assistance." To render more immediate aid and provide faster transportation, he designed a horse-drawn carriage staffed by a medical officer and assistant with room for several patients on stretchers. The first military ambulance corps in the United States was organized in 1862 during the Civil War as part of the Union army. The first civilian ambulance service in the United States was organized three years later by the Cincinnati Commercial Hospital. By the turn of the century, most major hospitals had their own private ambulances. The first motorized ambulance went into operation in Chicago in 1899. In areas where there were no major hospitals, the local undertaker's hearse was often the only vehicle capable of carrying a patient on a stretcher, and many funeral homes also provided an ambulance service. As a result, the design and construction of ambulances and hearses remained closely related for many years. Most early ambulances were simply intended to transport patients. After the doctor or fire department rescue squad applied first aid, the patient was loaded into the back of the ambulance for a quick ride to the hospital. In some cases, the doctor rode along, but most of the time the patient rode alone and unattended. In the United States that changed dramatically when the federal government passed the Highway Safety Act in 1966. Among its many standards, the new act set requirements for ambulance design and emergency medical care. Ambulances with low-slung, hearse-like bodies were replaced by high-bodied vans to accommodate additional personnel and equipment. Radios were installed. Many ambulances carried advanced equipment like cardiac defibrillators, along with an arsenal of life-saving medicines and drugs. Today, ambulances come in a wide variety of shapes and sizes. The simplest designs are equipped to provide basic life support, or BLS, while larger, more sophisticated designs are equipped to provide advanced life support, or ALS. Ambulances may be operated by private companies, hospitals, the local fire or police department, or a separate city-run organization. Ambulance manufacturers purchase many components from other suppliers rather than fabricate them themselves. The body framework is usually made of formed or extruded aluminum. The outer walls are painted aluminum sheet, and the interior walls are usually aluminum sheet covered with a vinyl coating or a laminated plastic. The subfloor may be made of plywood or may use an open-cored plastic honey-comb laminated to aluminum sheet. The interior floor covering is usually a seamless, industrial-grade vinyl that extends partially up each side for easy cleaning. Ambulance manufacturers purchase many components from other suppliers rather than fabricate them themselves. These include the vehicle cab and chassis, warning lights and sirens, radios, most electrical system components, the heating and air conditioning components, the oxygen system components, and various body trim pieces like windows, latches, handles, and hinges. If the ambulance has a separate body, the body framework is usually made of formed or extruded aluminum. The outer walls are painted aluminum sheet, and the interior walls are usually aluminum sheet covered with a vinyl coating or a laminated plastic. The subfloor may be made of plywood or may use an open-cored plastic honeycomb laminated to aluminum sheet. The interior floor covering is usually a seamless, industrial-grade vinyl that extends partially up each side for easy cleaning. Interior cabinets in the patient compartment are usually made of aluminum with transparent, shatter-resistant plastic panels in the doors. 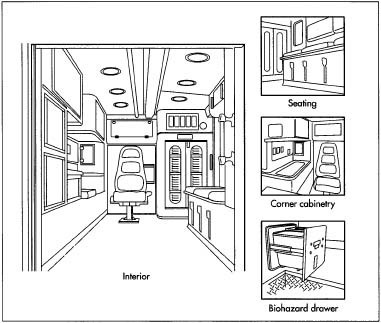 The counter and wall surfaces in the "action area," the area immediately opposite the patient's head and torso in the left-hand forward portion of the ambulance body, are usually covered with a seamless sheet of stainless steel to resist the effects of blood and other body fluids. Interior seating and other upholstered areas have a flame-retardant foam padding with a vinyl covering. Interior grab handles and grab rails are made of stainless steel. Other interior trim pieces may be made of various rubber or plastic materials. Ambulance designs fall into three categories. 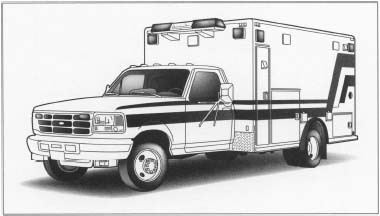 Type I ambulances have a modular, or detachable, body built on a truck chassis. The truck cab is connected to the body through a small window, but the occupants of the cab must go outside the vehicle to enter the ambulance body. Type II ambulances use a van with a raised roof. Because of the van construction, the occupants of the cab can easily enter the body from the inside, although the interior space is limited. Type III ambulances have a modular body built on a cut-away van chassis. This design combines the capacity of the larger modular body with the walk-through accessibility of a van. Interior cabinets are usually made of aluminum with transparent, shatter-resistant plastic panels in the doors. The counter and wall surfaces in the "action area," are usually covered with a seamless sheet of stainless steel to resist the effects of blood and other body fluids. Interior seating and other upholstered areas have a flame-retardant foam padding with a vinyl covering. Interior grab handles and grab rails are made of stainless steel. Other interior trim pieces may be made of various rubber or plastic materials. (OSHA) standards regarding blood-borne and airborne pathogens also apply. Within the framework of these standards, manufacturers may specify specific features and materials to provide their products with unique advantages in the marketplace. Ambulances are usually manufactured in a modified assembly line process, where the vehicle or body moves from one fixed area of a plant to another, rather than being pulled along an assembly line. Specific parts are brought to each area for installation or assembly. Different manufacturers may use slightly different processes. The following is a typical sequence of operations for the manufacture of a Type I ambulance with a modular body. 1 The structural components of the ambulance body—the supporting struts, braces, and brackets for the floor, sides, and roof—are either bent to shape using standard machine shop tools, or are cut from specially shaped aluminum extrusions that have been purchased from suppliers. The components are held in the proper position with a device called a jig and are welded together to form the body frame-work. 2 The exterior skin pieces are fabricated using standard sheet metal shop tools and are fastened to the outside of the framework using either mechanical fasteners or adhesive bonding. The external compartments are fabricated and welded in place. Finally, the external body doors are fabricated and are fastened in place on hinges. 3 The outside of the body shell is then cleaned, sanded, and spray painted with a primer. Next, a sealer is applied. This is followed by a base coat of paint, usually white, and then a clear coat of paint to protect the base color and give the surface a shiny appearance. Between each coat, the body is placed in an oven to dry. 4 Additional wiring is added to the cab, chassis, and engine electrical system to accommodate the warning lights and sirens and to bring power to the body. Additional switches and controls are added to the dash as required. The heating and air conditioning system may also be modified. 5 Holes are drilled in the vehicle frame rails and mounting brackets are installed to support the ambulance body. The frame rails may be cut to the proper length for the body. 6 The painted body shell is lowered onto the chassis mounting brackets and is bolted in place. 7 The cab is usually ordered with the same background color as the body, and does not require priming or base/clear painting. Most ambulances are specified with one or more colored stripes that extend along the sides and rear of the cab and body. The areas around the stripes are masked off with paper and tape so that the position of the stripes on the cab and the body match. The stripes are then painted and dried, and the masking removed. 8 The front and rear bumpers, which are not painted, are then installed. If the mirrors have been removed to paint the stripes, they are reinstalled. 9 The electrical wiring in the body walls and ceiling is installed from the inside, and foam panels are bonded in place to provide thermal and noise insulation. With the wiring in place, the exterior lights are mounted and connected, and the exterior latches, grab handles, windows, and other trim pieces are installed. 10 The oxygen piping and outlets, which are part of the patient life-support system, are installed in the body walls. The vacuum system, which removes blood, saliva, and other body fluids is also installed. If the ambulance body requires an auxiliary heating and air-conditioning system, it is installed at this time. 11 With all the systems in place, the interior cabinets are installed and the walls, floors, and ceilings are covered. The electrical power distribution board is installed in a forward compartment of the body and the panel is connected to the cab and chassis electrical wiring. If the ambulance is specified with an inverter, which converts 12 volts direct current from the vehicle batteries into 120 volts altemating current for use with certain medical equipment, it is also installed at this time. 12 The seats and upholstery pieces, which are either purchased or assembled in a separate area, are fastened in place. The interior grab handles, containers, and trim pieces are installed as the final step. The design of ambulances is regulated by several standards, and the manufacturer must take appropriate steps to ensure compliance with those standards. Each system is inspected and tested for proper installation and operation as part of the manufacturing process. In addition, every material, from the aluminum in the body to the foam in the head rests, is certified by the manufacturer to meet the required specifications. Many fire departments are finding that approximately 80-90% of their calls are for medical emergencies, while only 10-20% are for fires. In the case of medical emergencies, an ambulance has to be called in addition to the fire engine. Instead of responding to all calls with large pumpers or ladder trucks, some fire departments are starting to use smaller, lower-cost first-response vehicles that combine the equipment and patient transport capabilities of a rescue truck and ambulance with the fire suppression capabilities of a small pumper. These combination vehicles are able to handle a variety of emergency situations, including those involving small fires such as might occur in vehicle accidents. This saves wear on the larger firefighting vehicles, and eliminates the need to dispatch two vehicles to the same incident. In the future, an increase in traffic congestion and an increase in the average age of the population in the United States are expected to increase the number of medical emergency calls. When this happens, it is expected that the single-function ambulance may be replaced by a multi-function combination vehicle in many areas. Barkley, Katherine Traver. Ambulance: The Story of Emergency Transportation of Sick and Wounded Through the Centuries. , 1990. Haller, John S. Jr. Farmcarts to Fords: A History of the Military Ambulance, 1790-1925. Southern Illinois University Press, 1992. McCall, Walt and Tom McPherson. Classic American Ambulances. Iconografix, 1999. Kelly, Jack. "Rescue Squad." American Heritage (May/June 1996): 91-99. Sachs, Gordon M. "The Evolution of the Fire Service EMS Vehicle." Fire Engineering (July 1998): 22, 24, 26. Federal Specifications for Ambulances. General Services Administration Standard KKK-A-1822. American Emergency Vehicles. September 28, 1998. http://www.ambulance.com/ (June 29, 1999). McCoy Miller Corporation website. May 26, 1999. http://www.mccoymiller.com/ (June 29, 1999). Road Rescue, Inc. http://www.roadrescue.com/ (June 29, 1999).